Nashville, TN – June 7, 2016 – University of St. Augustine Health Sciences (USAHS), a leading graduate institution that emphasizes health and rehabilitative sciences education through innovative classroom education, will have several faculty experts presenting innovative, key research posters at the American Physical Therapy Association NEXT Conference. In addition to the USAHS expert presentations, the institution will also have an exhibit booth with important institution and educational program information. APTA’s NEXT Conference and Exposition is the leading-edge event that offers trendsetting programming and innovative content from professionals and thought leaders in physical therapy. The conference will be held June 8 – 12 at the Gaylord Opryland Resort & Convention Center in Nashville, TN. A Multi-Modal Gait Training Intervention for Chronic Stroke: A Single Case Design – Presented by Lindsay Perry, PT, DPT, NCS, on Thursday, June 9 from 11 a.m. – 1 p.m.
Handwritten Notes in an Online Course: A Pilot Study, Presented by Debra L. Gray, PT, DHSc, DPT, Med, on Friday, June 10 from 11 a.m. – 1 p.m. Strength and Cardiovascular Training Poststroke: Applying the Evidence, Part 1 and Part 2 – Presented by Melanie Lomaglio, PT, MSC, NCS and Lindsay Perry, PT, DPT, NCS, from 12:30 p.m. – 2 p.m., 2:30 p.m. – 4 p.m.
To schedule an interview with a USAHS expert or for more information on one of the USAHS faculty or expert poster presentations outlined, please contact Rachael Lighty at [email protected] or 410.218.6055. 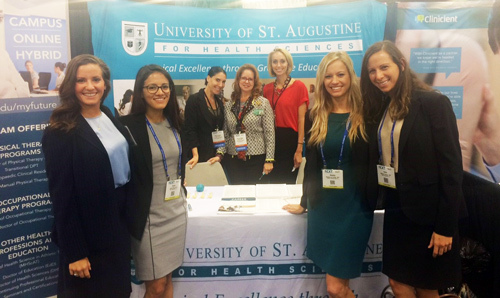 The University of St. Augustine for Health Sciences (USAHS) is a graduate institution that emphasizes health science education through innovative quality classroom and distance education. Founded in 1979, USAHS has locations in San Marcos, California; St. Augustine, Florida; Austin, Texas and Miami, Florida. USAHS offers degree programs in physical therapy, occupational therapy, nursing, education and health science, as well as continuing education programs. For more information, visit www.usa.edu. USAHS is a member of Laureate International Universities, a network of more than 80 institutions in 28 countries and one of the most significant global higher education providers for health sciences. For more information, visit www.laureate.net.